I was recently asked, "Which company would you recommend to someone who has concerns about their privacy, but is interested in testing in order to confirm a previously-undocumented relationship?" I usually respond that we should do our own research and make the best decisions we can for ourselves. I have done that for myself, but my situation will likely differ from other people. So, in order to assist people to make their own choices, I am posting links to the privacy policies for all of the major DNA companies, for easy reference. Please note that the information I am posting is correct to the best of my knowledge as of today. Things change very quickly in the world of genetic genealogy, so I can't guarantee that this information will stay current - please continue to do your own research on this very important topic. ​Finally, remember that DNA is very, very personal. Even if you have decided that you feel comfortable with submitting your own DNA to a testing company, or uploading the results to GEDmatch Genesis, this will not be true for everyone. No one should ever feel pressured into testing or sharing their results with you or others. DNA testing should always take place with full and informed consent. That said, the promises of genetic genealogy continue to be very exciting. So do what feels most comfortable, and try to understand that others are probably doing the same. Disclaimers: I am not employed by any of the above companies, and do not receive any remuneration when someone buys a DNA test after viewing my web site. I have been approved as a Contractor for Ancestry ProGenealogists, and I also volunteer as a co-administrator for the Ogilvy surname project hosted by FamilyTree DNA. I was admiring a friend's redecorated office recently. As I scanned the wall, looking at framed photos and artwork, she pointed out a large cross stitch. The timeworn fabric contained the names and birth dates of a very large family, with the heading "Parents and Children." The parents were stitched in at the top, followed by twelve children, all with the same surname as my friend's husband. Separated at the end were the death dates of two of the children (one less than a year old), as well as the date the mother finished her needlework, approximately five years prior to her death, which was also recorded in the same style. I was thinking about how fortunate her husband's family was to have kept such a treasure in their family, when my friend told me the story of how it came into their possession. It turned out that her college roommate's mother had found it at a second-hand store in Kansas. She purchased it and kept it hanging on a wall in their home. Eventually, when she was downsizing, she thought of my friend, who was getting married to a man who shared the same surname as this family. She offered it to them, and they gladly accepted it. So, in fact, the family hanging on their wall was not at all related to my friend's family, that she knew of. I realize that there are many early-American families whose vital information was recorded by needlepoint in this fashion, particularly during the 18th and 19th centuries, so this may not be the most "unusual source." (In fact, needlework has been used to support pension claims!) That said, how many of these works of love have been destroyed by time, or handed down to second-hand stores, rather than to grateful relatives? No one in my family has inherited something like this, that I know of - what about you, dear Reader? Could an unrelated someone be lovingly displaying the genealogical evidence you have been seeking on their wall right now? My friend treasures this handwork, and happily agreed when I offered to help her learn more about this family. Using the dates sewn into this fabric, I was easily able to find a Find A Grave entry in Kansas for the mother of this family, which is where we found a beautiful tribute from her obituary. We'll do a little more digging... wouldn't it be amazing if it turned out that her husband actually WAS related?? 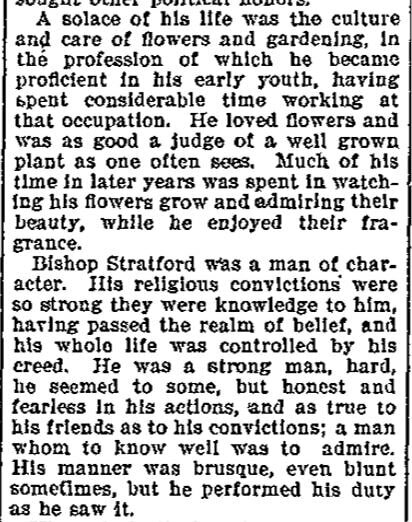 My great-great-great-grandfather, Edwin Stratford, is an excellent candidate for this week's post. He worked diligently in several fields (including some actual fields) - I am always inspired by his accomplishments when I read about his life. According to information recorded in newsprint and biographies by his relatives (found on FamilySearch), Edwin spent his early years working as a gardener on an estate in Maldon, Essex, England. The son of a cabinet maker, Edwin was the eldest of ten children. For a short time prior to his work as a gardener, he sold newspapers in London, while the family briefly lived there. At the age of 19, he also labored as a missionary for his church, and, after marrying in 1855, he and his wife, Marianna Crabb Stratford, emigrated to the United States. During their six-year-journey West, he performed farm labor, and earned money chopping wood. He also acted in church leadership roles and supported his growing family. Once they arrived in Utah, in the Fall of 1861, he built a house in Farmington, for which he bartered labor for goods and materials. By 1864, he had moved his family to Cache Valley, Utah, where he built another house, and started a farm. In this community he built "canals and canyon roads." He also commenced work as a school teacher in Millville, two miles away. During this period he served as the county assessor and collector. He remained in Cache Valley until 1872. 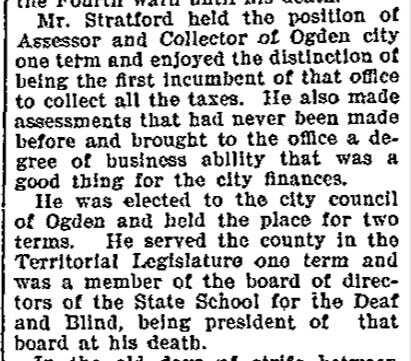 As you can see in the above (and following) clippings from his obituary in the Ogden Daily Standard, Edwin was able to transfer his skills toward many different enterprises. But he was still just getting started! As a gardener myself, this next paragraph warms my heart. Knowing that he carried his passion for flowers all the way from his teen years in England, to the untamed desert environs of Utah - literally making the desert bloom - brings me so much joy and connection to this man. I also love the description of his strong character at the end. 1. 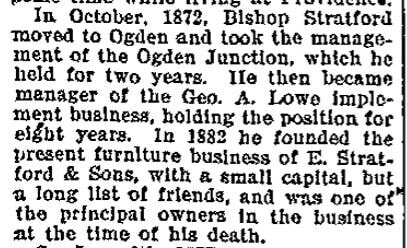 "Gone to His Rest," Ogden Daily Standard (Utah), 9 October 1899, page 4; Utah Digital Newspapers (https://newspapers.lib.utah.edu : accessed 8 September 2018). All facts in this post reference information recorded in this obituary. ... and back to blogging! My kids started back to school this past week. Whew! I am already suffering from waking up earlier than usual. I have so much respect for teachers who wake up early every morning, often getting their own kids off to school, in order to be there for our children. I know that this is the case, because my mother was a teacher. Her mother was also a teacher. I volunteer at school often, because I know how much work teachers put in, and also how much support they need. I've been known to say, "You can always tell who the teachers' kids are, because they are usually the first to help out." My maternal grandmother, Marjorie Skeen Russell, was fortunate to attend college at the University of Utah, where she received her degree in physical education. While she rarely had a classroom of her own, my grandma taught children in many capacities during her life. Among other endeavors, she was a substitute P.E. teacher, a driver's education instructor, taught Kindergarten at a private school, and was a docent for Utah's Hogle Zoo, bringing animals into classrooms. 1931 Eastonian (high school) senior year photo Source: Ancestry, "U.S., School Yearbooks, 1880-2012"
She credited her passion for learning and discovery to her own experience as a young student at the William M. Stewart School. The school's new building was constructed on the University of Utah campus just a year before she started Kindergarten in 1919 (according to my best calculations). ​It acted as the Normal School or "lab" school for the College of Education, and many of the children who attended were children of professors or others associated with the University of Utah. The teaching philosophy was very hands-on and experiential. The teachers capitalized on the many connections with parents and associates by making the campus their classroom. Little Marjorie Skeen may have participated in this dinner. My grandma loved recounting her early school days. One of the memories she shared was of walking across 500 South (just South of the university) to Mt. Olivet Cemetery, where the class would observe and catch tadpoles. As older students, they raised chickens on the roof of the school, and sold the eggs. The children practiced their math skills by keeping track of egg sales. She related her pride at being selected to ring the school bell. The bonds the children formed lasted a lifetime. I have memories of my grandma still regularly meeting her "Kindergarten friends" for lunch when she was in her 80s. While I was trying to learn more about the school, I found an article written in 1988 when a reunion for the school was being organized. It described the wonderful environment created for the students - you can read all about it here. It really sounded like a dream for the entire school community. I can say, without a doubt, that my grandmother's experience at this school has rippled out far and wide for many years. My grandma used the hands-on model of the school while raising her own children, making sure they played with clay and got out to explore nature. My mother grew up to be a dedicated teacher, whose use of experiential learning earned her the 1999 Presidential Award for Excellence in Mathematics and Science Teaching. Much like my grandma, while I have never had my own classroom, I spent my 20s and 30s in the field of outdoor education, sharing the wonders of our natural world and gardening with young children, including my own. So many lives have been influenced by the efforts of the Stewart School - I'm left feeling very grateful for it! 1. "Marjorie Skeen Russell, Obituary," Deseret News (Utah), 1 November 2001; Deseret News Archives (​https://www.deseretnews.com/article/885020/Obituary-Marjorie-Skeen-Russell.html : accessed 2 September 2018); also telephone conversation with author's mother/daughter of Marjorie Skeen Russell, 1 September 2018. 2. "William Stewart Building (1920)," revised 12 March 1998, University of Utah Graduate School of Architecture; University of Utah Historic Buildings (​http://students.arch.utah.edu/hba/htmlfiles/bldg006.html : accessed 3 September 2018). 3. 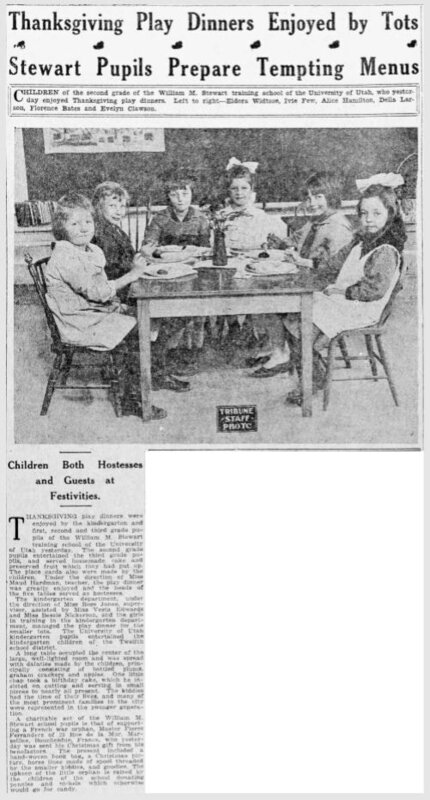 "Thanksgiving Play Dinners Enjoyed by Tots, Stewart Pupils Prepare Tempting Menus," Salt Lake Tribune (Utah), 27 November 1919, page 22; Utah Digital Newspapers (https://newspapers.lib.utah.edu/details?id=15066768 : accessed 3 September 2018). 4. "Stewart School Is Having a Reunion," Deseret News (Utah), 27 September 1988; Deseret News Archives (https://www.deseretnews.com/article/18645/STEWART-SCHOOL-IS-HAVING-A-REUNION.html : accessed 3 September 2018). Now that I am just past the halfway point of the 52 Ancestors in 52 Weeks challenge, I wanted to take a minute to reflect. First, I am so glad that I chose to participate! I hadn't intended to keep an active blog when I created my website, but couldn't resist participating after reading such inspiring posts from others. As Amy Johnson Crow has reminded us, there is no "behind" in this project - it's all about the progress. My favorite thing about participating has been that, even when I start a post thinking I already have all the information on my topic, I ALWAYS end up learning something new as I write. I have located so many new documents, and even busted through a longstanding brick wall on my maternal line, thanks to being forced to ask myself the question, "How do I show others that this information is true?" I started out a little behind, and have really worked hard to stay on top of my posts each week, as our Michigan Winter slowly melted into Spring. I was doing pretty well until Summer hit, and then my kids came home from school. This is my first Summer as a practicing genealogist. I have learned that I need to lighten my genealogical commitments during this season, so that I can spend time with my family, do a little traveling, and work on all the little things I've been putting off, like edging the lawn! I have also started taking on client work, which has left me with less time for crafting posts of the caliber you've come to expect from me. That said, I'm not out of the game quite yet! I am looking forward to getting back to researching and writing new posts soon, but it might have to wait until I finish a couple of client projects, and get my kid back to school. I have really enjoyed the entire process of writing these posts, and am looking forward to the discoveries waiting to be made in the weeks to come! My childhood was full of music. My mom would break out into song whenever the mood struck her - Broadway classics, movie tunes, church songs, traditional ballads - she had a song in her pocket for nearly every occasion. Her mother, Marjorie Skeen Russell, was also very musical. We loved to listen to her sing early 20th Century songs, as she played the piano or the organ, and couldn't wait for our turn to try them out. Sadly, I never learned to read or play music, but I have always enjoyed listening to it, and have encouraged music lessons for my kids. When my son was a newborn, and I was in a sleepless fog, I struggled to remember the words to the songs that my mom would sing to me. Eventually they came (after I looked up the lyrics, or more often, just made up new words), and now I am the mom who has a song in my pocket. I remember groaning as my mom would get the words wrong, but now the roles have reversed, and I am the one filling in the words, as my own children roll their eyes. I hope they, too, will learn one day that it doesn't matter who is listening, or if you miss a note, or change the lyrics... singing brings joy, and a connection to everyone who has sung before you. I grew up on the road - most of my early memories involve some version of piling into our family van and staring out the window for hours, watching the landscape slowly evolve. I've had the privilege of passing through nearly all of the states, and have visited Mexico, Canada, and several European countries. I'm always thinking of the next place we will go (which usually includes a family visit, or more often now, a graveyard visit! ), and have raised my kids with the expectation that we will travel whenever we can swing it. That said, the concept of traveling for pleasure is still fairly new in the history of my family. Even my grandparents, who had the means to travel, usually went on trips to visit their far-flung children and other relatives, not on pleasure cruises or to explore the world, just for the thrill of it. Beyond that, nearly all of the travel stories throughout my ancestry are the stories of immigrants - they tended to book one-way tickets. Because I come entirely from Mormon pioneers, most of their stories have a similar pattern: Living in another State/Country, Religious Conversion, Preparing to Leave, Meeting in the Middle (Ohio/Missouri/Illinois/Nebraska, arriving by boat or wagon), Traveling West (by wagon/handcart, and later, by train), and Arriving in Utah. The majority arrived in the 1850s, and all of my family was in Utah by 1874. My great-great-great-grandmother, Helen (AKA Ellen) Blackwood Russell, traveled with her family (which included her husband, John, and nine of their eleven children), from Scotland, arriving in New York City on the S.S. City of Manchester, on 13 June 1862. The story goes that she suffered from sea-sickness, and was not feeling well throughout the long journey. After the ship landed, her husband went off to find some fresh food to assist in her recovery. He came back with a nice, red apple for her to eat. After one bite, she handed it right back to her husband and told him to throw it away, stating "That apple's been poisoned!" The "apple," they learned later, was not an apple after all, but, in fact, a tomato - they had never encountered one during their time Scotland! One of the things I love most about traveling is discovering things which seem mundane to the people living there, but are very new to me. I'm not sure that Helen felt the same way?!? But seriously, the poor woman! She went on to help deliver the babies of sixteen women during their trek West, without any training as a midwife. I can't help but think how brave she must have been to leave her homeland, to raise all those children (and losing a couple to accident and disease), to travel into the untamed West, and to create a new life in a strange land. Even now, with all of our modern luxuries, it certainly takes a fair amount of courage to embark on a path to new places, regardless of whether you are holding a one-way ticket, or plan to return to the safety of your home two weeks later. So here's to Great-great-great-grandmother Helen - I think of her whenever I bite into an apple! 1. ​"New York, Passenger Lists, 1820-1957​," database with images, Ancestry (www.ancestry.com : accessed 14 July 2018), entry for Hellen Russell, aboard S.S. City of Manchester (Liverpool to New York), arriving 13 June 1862; citing National Archives microfilm serial: M237, Passenger Lists of Vessels Arriving at New York, New York, 1820-1897, roll: 220, line: 44, list number: 549; Records of the U.S. Customs Service, Record Group 36, National Archives at Washington, D.C.
2. 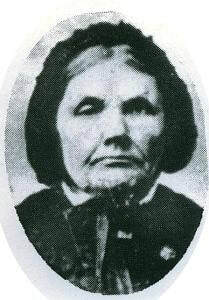 "Catherine Russell Hinchcliff," by Winnifred Riley Lamb, FamilySearch (https://www.familysearch.org/photos/artifacts/2688858 : accessed 14 July 2018); citing an earlier version written by Hattie Hinchcliff Riley and submitted to Daughters of Utah Pioneers, 1926. 3. "Catherine Russell Hinchcliff," by Winnifred Riley Lamb. I hope you all enjoyed celebrating the 4th of July this week! I grew up loving this day - my town always made it a highly-anticipated, day-long affair. That said, I have often stated that, while I might have Patriots in my line, I had not yet verified a connection to them. As I have mentioned before, I have Loyalist ancestors - John Ogilvie and father/son duo James Lake, Jr. & Sr. - and so have been more aware of their stories of leaving land in the former colonies, and settling in Nova Scotia and Ontario. I believe that this has made me a little more sympathetic to the Loyalist cause than the average American, particularly since I have been lacking in stories about brave, revolutionary colonists to balance the narrative. After hearing myself joke about having more Loyalists in my tree than Patriots this past week, I decided to it was time to dedicate myself (and this post), to learning more about the Patriots in my line. I sat down and made a list of each of my great-grandparents' families, pulled up my tree on FamilySearch, and systematically identified any possible lines which might have had an ancestor who was in the right place, and of the right age, to have participated in the Revolutionary War. Once identified, I then checked their names on the online databases for both the United Empire Loyalists' Association of Canada (UELAC), and the Daughters of the American Revolution (DAR). The results were very surprising to me! Honestly, I'm a little embarrassed to admit that I had not done this before. I now have a list of SIX identified ancestors who are in the DAR's ANSWER database, as well as at least three more possible ancestors who were in the right place at the right time. I also found a potential listing for yet ANOTHER Loyalist in my family, as well as two other ancestors who seem to have followed a Loyalist migration pattern. Wow! I will add the caveat here that I based my search on what others have entered into my shared family tree on FamilySearch. I still need to follow and evaluate the evidence for each line, in order to verify what others have put forward. (This reminds me of the time I thought I might have a Mayflower ancestor, but once I looked into it, I quickly determined that it was a big mistake - don't believe everything that others put out as fact!) This is enough work to keep me busy for several months, and probably part of what kept me from looking into this for so long in the first place... wish me luck - ha! While I still plan to do more reading and data-gathering, I do feel fairly confident about being related to three Patriots through my Farnsworth line. My great-great grandmother was Cosmelia E. Farnsworth Ogilvie. It is through her grandparents, Reuben Farnsworth III and Lucinda Kent, that I am connected to DAR Patriots Reuben Farnsworth, Jr. (#A038756), and Cephas Kent, Jr. & Sr. (#A064988 & #A064970). Here is a lovely blog post written about the younger Cephas Kent, by Mary Mettler: http://blog.californiaancestors.org/2008/09/tuesday-tales-from-road-dorset-vermont.html. I can't tell you how exciting it has been just to scratch the surface of information for these ancestors of mine, and how inspired I am to start learning more! If you are interested in finding out about the roles your ancestors may have played in revolutionary times, follow the steps I've outlined above, and then start verifying the information you've found with original documents. If you are on Ancestry, you can view past applications to the Sons of the American Revolution (SAR), in this collection: "U.S., Sons of the American Revolution Membership Applications, 1889-1970." You might even find that one of the applications was written in the handwriting of one of your own ancestors! I am, despite my proud Loyalist heritage, wishing a very happy Independence Day to you all with new-found confidence! FamilySearch (https://www.familysearch.org/photos/artifacts/5038880 : accessed 8 July 2018). ​2. Image of Stephen Martindale Farnsworth, ​Pioneers and Prominent Men of Utah, Frank Esshom, Utah Pioneers Book Publishing Company, Salt Lake City, Utah, 1913, pg 285; viewed at Google Books (https://books.google.com : accessed 8 July 2018). Note: variations of this image have been distributed widely on FamilySearch and Ancestry. 3. "Dorset VT Kent Corner Dorset Convention Marker," digital image, Wikipedia: Kent Neighborhood Historic District (https://en.wikipedia.org/wiki/Kent_Neighborhood_Historic_District : accessed 8 July 2018), photo credit: MagicPiano, ​CC BY-SA 4.0. My first idea for writing this post was to delve into the "George Foreman-style" naming pattern I have in my own family. That is, George Byers Ogilvie named his first son from his first marriage (my 3x great-grandfather), George Ogilvie, which gets a little confusing, especially when the descent continues with George William Ogilvie, and then William George Ogilvie. It is even more disorienting when you add in George McAuslan Ogilvie, who was the first son of George B. Ogilvie's second marriage, making him George's half-brother. I'm sure you can appreciate why I decided to go in a different direction, instead! So let's circle back around to George Byers Ogilvie's first wife, Barbara Elizabeth Ogilvie, and their first daughter, Barbara Elizabeth Ogilvie (believe me, this IS the easier choice!). Actually, his wife was Barbara Elizabeth (Mattatall) Campbell Ogilvie. Their daughter was later known as Barbara Elizabeth (Ogilvie) Lang Buchanan. Thankfully, we can now distinguish between them on paper. However, you can see how, prior to the daughter's marriage, the two women could have been known by the same name for several years. I'm sure the family found ways to keep their names straight while they were living - at least one record indicates that the daughter went by "Elizabeth," instead of Barbara. Once you have viewed this image, it is easy to see that the first photo was snipped straight from it. German Buchanan was the second husband of Barbara Elizabeth Ogilvie, the daughter of George Byers and Barbara Elizabeth (Mattatall) Campbell Ogilvie. The snipped image, labeled only as "Barbara Elizabeth Ogilvie," was easily confused as a photo of her mother, who may never have had a photo taken prior to her death in 1867 - about ten years prior to this photograph. Best of luck to those of you who are also trying to keep your same-named family members straight. With attention to detail and perseverance, it can be done! 1. Find A Grave, database and images (https://www.findagrave.com : accessed 20 June 2018), memorial page for George McAuslan Ogilvie (5 Dec 1859 - 12 Sept 1882) Find A Grave Memorial no. 23520961, citing Knights of Pythias Cemetery, Elko County, Nevada; photo credit Marcena Thompson. 2. Find A Grave, database and images ((https://www.findagrave.com : accessed 20 June 2018), memorial page for Barbara Elizabeth Ogilvie Buchanan (19 May 1829 - 31 Mar 1885) Find A Grave Memorial no. 37988047, citing Johnson Cemetery, Kane County, Utah. 3. Individuals in this Company, Jacob F. Secrist/Noah T. Guymon Company (1855); online database, Mormon Pioneer Overland Travel (https://history.lds.org/overlandtravel/companies/263/jacob-f-secrist-noah-t-guymon-company-1855 : accessed 2 November 2017); citing "2nd Company of 50 reports,” 31 May 1855; report, CR 1234 5, box 1, folder 37, Emigrating companies reports 1850-1862, Reports 1853-1855, Brigham Young office files, 1832-1878, Church History Library, The Church of Jesus Christ of Latter-day Saints, Salt Lake City. 4. Photo of Barbara Elizabeth (Ogilvie) Lang Buchanan, circa 1877, digital image, FamilySearch (https://www.familysearch.org/photos/artifacts/100125 : accessed 20 June 2018); shared by shirleyberdeanleavitt1. 5. Spanish Fork Cemetery Records Office (Spanish Fork, Utah), Marty Warren to Ginger Ogilvie, email with digital image, 29 June 2017, providing administrative record for Barbara E. Ogilvie, unsurveyed plot; and Spanish Fork Cemetery (Spanish Fork, Utah), “Cemetery records, 1866-1898,” p. 23, Barbra E. Ogilvie entry; Family History Library (FHL) microfilm 008195204; FamilySearch (www.familysearch.org : accessed 9 November 2017). 6. ​Photo of German Buchanan Family, circa 1877 digital image, FamilySearch (https://www.familysearch.org/photos/artifacts/1375563 : accessed 20 June 2018); shared by TravisElder. 7. Spanish Fork Cemetery (Spanish Fork, Utah), “Cemetery records, 1866-1898,” p. 23, Barbra E. Ogilvie entry. 8. Find A Grave, database and images ((https://www.findagrave.com : accessed 20 June 2018), memorial page for German Buchanan (9 Dec 1870 - 22 Jun 1938) Find A Grave Memorial no. 77698, citing Pleasant Grove Cemetery, Utah County, Utah.